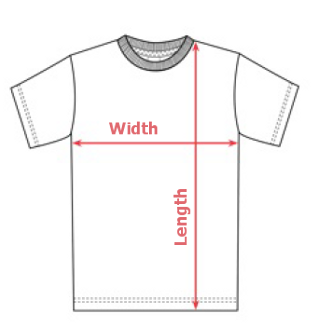 While our shirts are preshrunk 100% cotton, you should expect up to 5-10% more shrinkage. Long Sleeve t-shirts should shrink less than tees. Hoodies are a 50/50 cotton/poly blend so expect less shrinkage. For pics of random car nuts in different size shirts, check our Awesome Fit Guide. When in doubt, we recommend ordering one size up. Hey, it's a t-shirt. There is a good chance you have a few already so just use this chart as a guide. Expect some small variability in the dimensions. Length 28" 29" 30" 31" 33" 34"
Sleeve 34 ½" 35 ½" 37" 38" 40" 41"
Length 26" 27" 28" 29" 30" 31"
Sleeve 33" 34" 35" 36" 37" 38"
Width 17" 19" 21" 23"
Width 14" 16" 17" 18"
Length 18" 20" 22" 24"